Welcome to Local 3207's Web site! 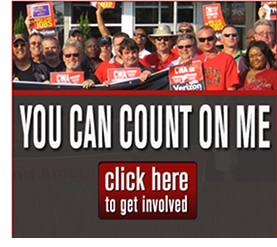 CWA members are employed in telecommunications, broadcasting, cable TV, journalism, publishing, electronics and general manufacturing, as well as airline customer service, government service, health care, education and other fields. In the Augusta, Georgia area, we represent employees from AT&T. Member's Appreciation Day Saturday October 27th! Thanks to all those who participated in the PAF Drive. Congratulations to Mike Leonard who won the 55" Color TV. We had guest speakers Tom Carr from Nettworth, Kathy Cannady, Benefits Coordinator, & Tony Tilley, CWA PAF Coordinator. CWA urges you to take action against this proposal. CLICK HERE TO FIGHT THIS PROPOSAL - IT'S A THREAT TO YOUR JOB! You are an integral part of your local. We can't conduct many functions of the Local without our members present at the monthly meetings. If the triangle is broken on any side, sooner or later it will be broken on every side. CWA's founding President, Joseph Bierne, called this the "triple threat".